I've never used an eye cream before and my first encounter has been with Green People's Rejuvenating Eye Cream*. This organic cream is scent free and suitable for ultra-sensitive skin. 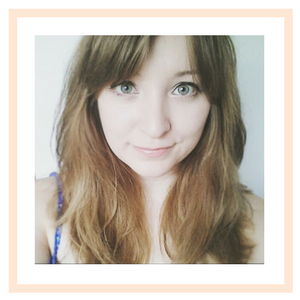 I'm very nearly in the middle of my twenties and lately I've been thinking about using skin care products with anti-ageing properties. I've started to notice a few very fine lines around the eye area and it seemed best to tackle this first. 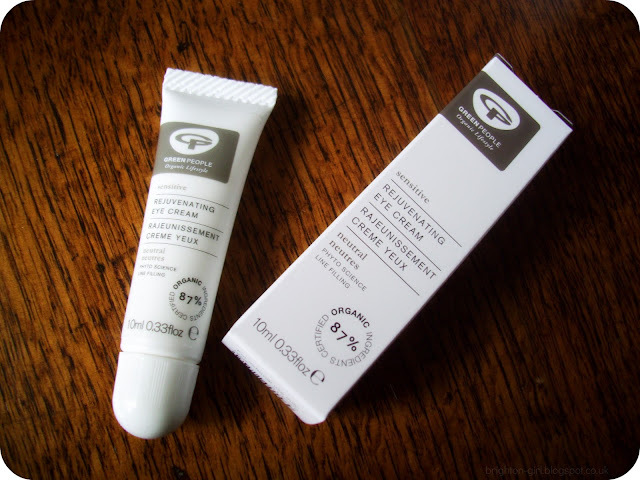 As always, Green People's products are full of natural goodness and this eye cream is certainly no different. It boasts an impressive natural ingredient list. There's jojoba and squalane to aid moisture retention. Shea butter, avocado and evening primrose oils that enrich the skin with essential fatty acids; Omegas 3, 6 and 9. Aloe vera, perilla oil and marshmallow extracts are calming and help combat redness and irritation - perfect for sensitive skin. Finally, the combination of tara bush, seaweed and baicalin targets fine lines and wrinkles and promotes skin cell life. That's a whole lot of plant power! I apply the cream to the eye area at night, dabbing it on lightly. You only need to use a teeny, tiny bit and I'm sure the tube is going to last me a good while. Upon application my skin feels calm and soothed. I have very sensitive eyes and it doesn't take much for my eyes to puff up and become sore. With this cream, I've had no such problems. It's perfect for those with sensitive skin who are prone to allergies and eczema. I've been using the cream for just over two weeks now. I would fully recommend it for anyone in their twenties. (I'm going to be reviewing how the cream performs on more mature skin in a few weeks time, after enlisting the help of my Mum!) I have seen an improvement in the appearance of my under eye area. It looks plump, smooth and feels nourished and moisturised. The very few fine lines I had are still there but maybe less pronounced due to the improved quality of the skin. I believe no cream is ever going to perform miracles. Laughter lines are a part of growing older and wiser and I'm prepared to fully embrace them. However, I do think it's highly important to keep your skin looking healthy and full of moisture and Green People's Rejuvenating Eye Cream* certainly does a good job of fulfilling this brief! Which eye cream do you use?